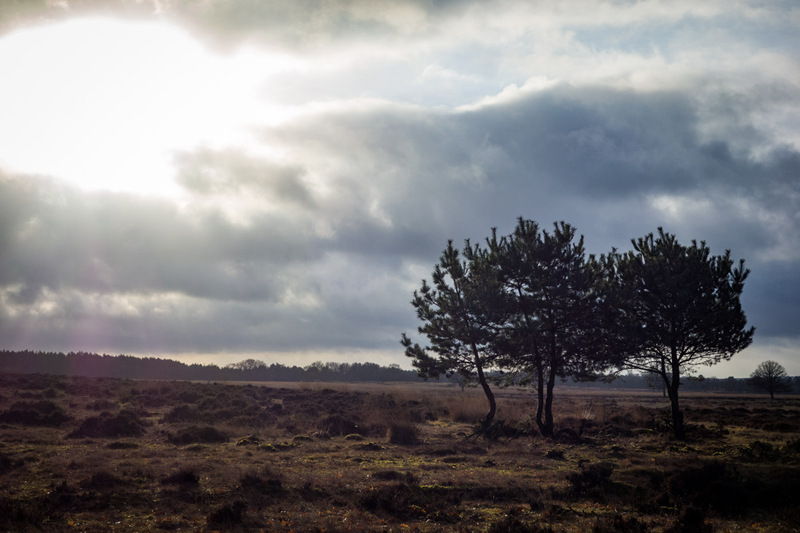 Quite centrally located in the Netherlands is an area called the Veluwe. For a weekend getaway we chose this area for a short all women cycle tour. 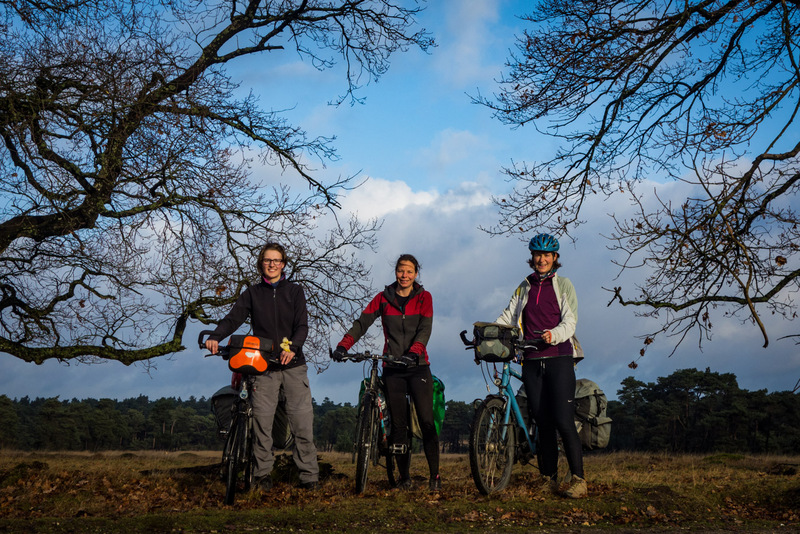 We are planning on doing a short cycle tour like this at least four times a year to discover the Netherlands and to stay in touch with Dutch cycling women 🙂 It is also just really nice to venture out of your door in your own country, to open your eyes to situations that you usually don’t see and to be active and outside with like minded people. Saturday 10th of december around 10:00 o’clock. I am walking out of the Amersfoort train station and am greeted by the curious and smiling face of Myrthe. We haven’t met before so we start chatting about all things bicycle touring, bicycles, previous trips and what both of us are doing now. We are waiting for Lucie who missed her train connection from Leeuwarden. Myrthe coming from Amsterdam, myself from Rotterdam and Lucie from Leeuwarden we have decided to meet in the middle and do a loop before going home the next day. Lucie hops through the gates at the station and it is nice to see her again. We met before at an evening with drinks with a group of 12 Dutch cycling women but didn’t really speak that much. 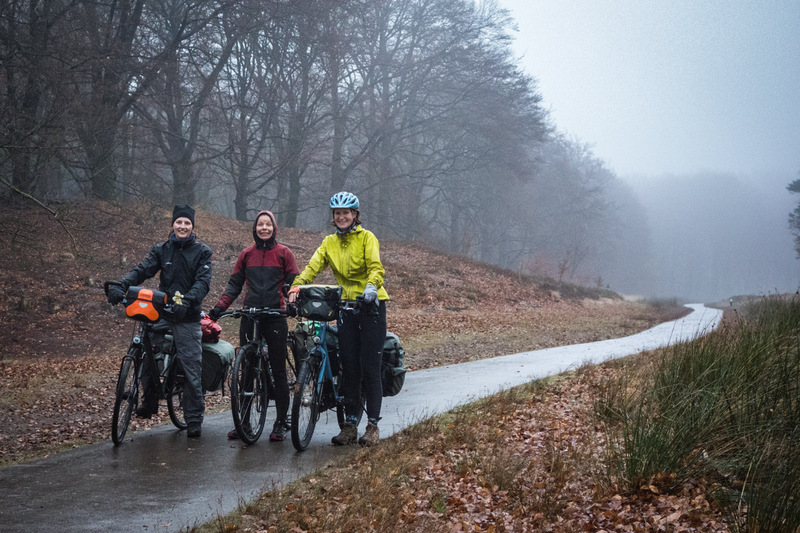 Now there is the chance to get to know more about these interesting inspirational women who venture on bicycles through the world. We set off and I adjust the GPS. We are following the Dutch “knooppunten” route marked by numbers we follow along the way. But sometimes if you miss a number it is hard to find the way back again so I have also uploaded it to the GPS just in case, although everywhere is easy to find in the Netherlands and getting lost is not a problem at all (because there are always people to help and maps everywhere). We cycle out of Amersfoort and before we know it we are on quiet country roads. Open fields alternate with forests, farms and villages. Geographically we don’t really know where we are because we are following the numbers, so we feel a bit as if we could be anywhere in the world. Lucie has spent a year cycling in North and South America. We talk all things about the Andes, cycling the great divide, casa de cyclistas, practicalities, definitions of time, space and freedom, homecoming and adjusting. Myrthe has cycled in Europe for six months which really felt good for her and she is longing for more. She now stays active as a bicycle messenger. The subjects evolve around the bicycle community, bicycle travelling women, ideas for the future and also slowly become more easy, relaxed. We intuitively learn fast about how to communicate together and how our synergy works, it is an interesting process when new groups form. Especially because we are all used to cycle by ourselves or in different company. We come across some great quiet gravel roads ideal for cycling, chatting and enjoying nature. We see some interesting birds but not much in the name of wildlife. We are surrounded by forest at this point and are every time quite surprised what our own country has in store for us. The Netherlands are very flat but still quite diverse in the surroundings that are offered. After the end of the first gloomy day we arrive in a town where we think we might be too late to stop for groceries, but our calculations are correct and we have 10 minutes to shop before the supermarket closes. An easy vegetarian pasta meal. We have booked an uninspiring cabin which should have a gas stove, but because of winter season it is not connected. Good that we bicycle tourers come well prepared and self sufficient with a stove that also provides some additional warmth in the very cold and chilly cabin with a heating system fixed to the roof (who invents that?). During the afternoon the fog thickened and slowly moist was making us wet. We clothed ourselves with our rain gear and pushed onwards. The cabin finally became warm so we could dry our clothes and it turned even hot like a sauna during the night. Waking up after a day of cycling is the best. We were all nice and warm inside our sleeping bags and reluctant to start the day. We made tea and warmed up before heading out. We only had a short section today but how beautiful it was. We cycled through heather fields and moorlands. The sun was out and it was almost warm. It was so great. We started cycling quite by ourselves, enjoying our surroundings. Lucie enjoyed to push a bit more and Myrthe and I were a bit behind warming up our muscles and finding the rhythm. We took a left turn from the road and this really cool sandy road appeared. There are fences to keep the wildlife in this nature area and we met quite a few other cyclists out on this Sunday morning. A group of four mountainbikers was taking a rest while we cycled by. They were interested if we were on a trip and where we were from. 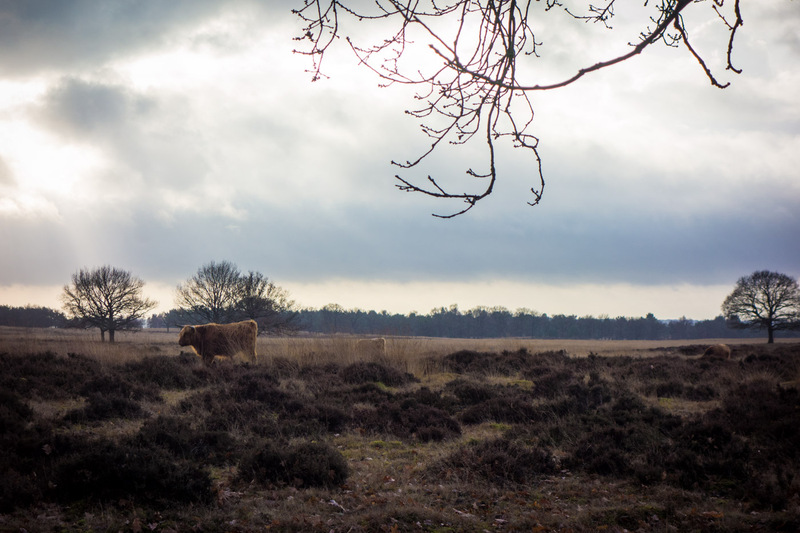 The Veluwe is their backyard and they were happy to hear that we had travelled this way to see the natural surroundings where they cycle every weekend. It was a very nice morning ride and slowly we were inching closer and closer to Apeldoorn. In Apeldoorn we were going to meet up with Miriam. 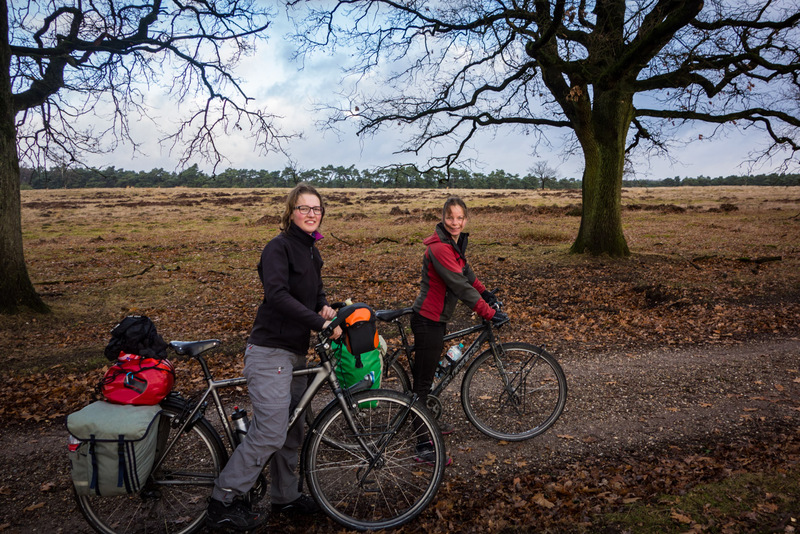 She reached out to us after we had posted on Facebook that we had a plan to cycle in the Veluwe area. Miriam a.k.a. Cycling Dutch Girl has cycled for a long time herself and has only returned recently to the Netherlands to become a mother. It was great meeting with her and her little daughter and sharing cycling conversations, experiences and just have some good time together. By now we were at the end of the small bicycle trip. We cycled to the station in Apeldoorn and then it was time for all of us to say our goodbyes and decide when is the next time we would head off for a short weekend. It is nice to keep the cycling spirit alive!